When I think back onto my childhood I often wonder how my mother survived (LOL), and then I realize she was a "yes mom" - she really had no choice - and maybe unknowingly she was giving us the greatest gift of all by allowing us to be kids. We live in such a fear-based society now - sad. As a child I remember swinging on vines over a ditch that was 15 feet deep, I remember always being barefoot, I remember climbing the gigantic magnolia tree in our backyard to the very tippy-top, I remember riding 3-wheelers, building ramps, putting dish soap on the trampoline with the sprinkler on (and this was before pads or nets), putting my younger brother in a box and sending him flying down the roller belts at my grandparents furniture factory, climbing on the roof at 9 years old, pouring water on our bathroom floor to slide across, etc etc (I could go on and on). I remember my parents being FUN (yes, they discouraged some of these dangerous things, but ultimately - they trusted us to know our abilities). I love having fun, I love feeling like a kid, I love giving that to my son. This may not be too risky, but it sure was fun. 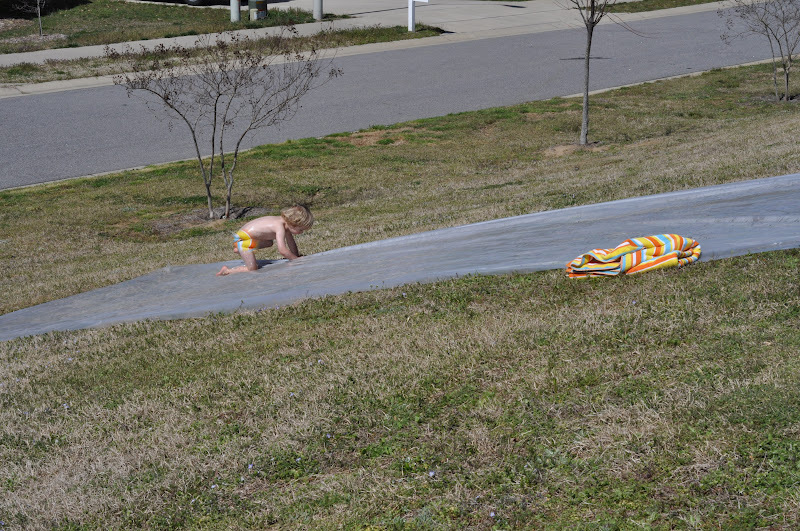 There is a big hill across the street from our house - perfect for a slip-n-slide. Today I bought 5 bottles of baby oil, used stakes to secure the tarp to the hill, invited RL and her girls over, and let the fun begin. The hill is big and the tarp was huge (10' X 25') and the pics don't do it justice. 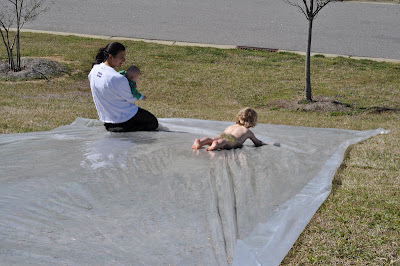 RL enjoyed the slide, too!!! That is the best! 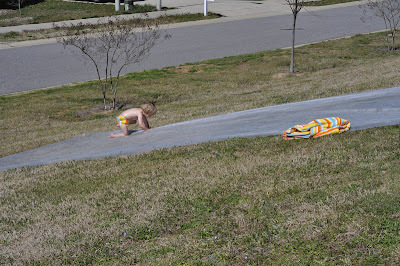 Slip 'n' slides are the most fun and they have at least one guaranteed injury with every go! I myself sustained a concussion on one! Great memories!!! Long-time reader, first-time commenter... :) ...this is brilliant. And I can picture cars going by with kids in the back begging their parents to set one up for THEM, and the parents tsk-tsking and telling the kids how dangerous it is. Keep up the good work!